Amazon ECS and Amazon ECR now have support for AWS PrivateLink. AWS PrivateLink is a networking technology designed to enable access to AWS services in a highly available and scalable manner. It keeps all the network traffic within the AWS network. 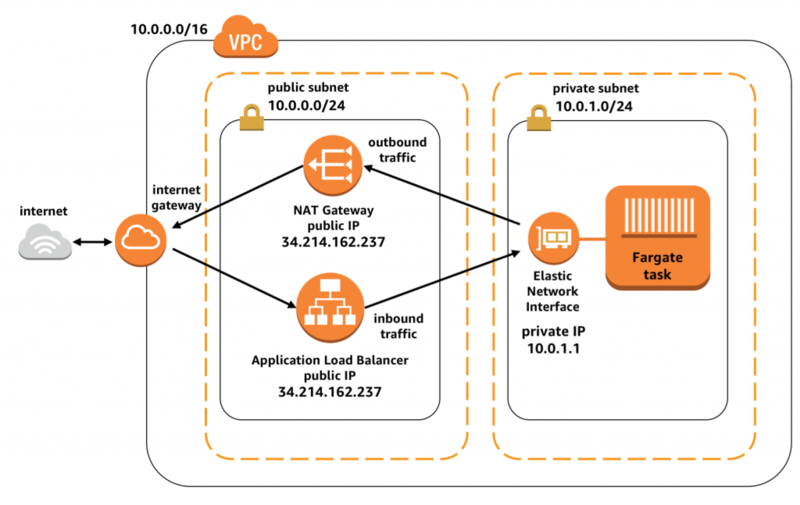 When you create AWS PrivateLink endpoints for ECR and ECS, these service endpoints appear as elastic network interfaces with a private IP address in your VPC. Before AWS PrivateLink, your Amazon EC2 instances had to use an internet gateway to download Docker images stored in ECR or communicate to the ECS control plane. Instances in a public subnet with a public IP address used the internet gateway directly. 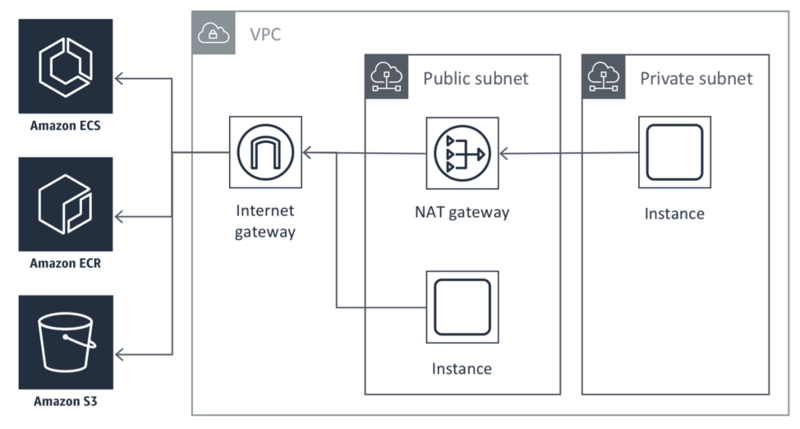 Instances in a private subnet used a network address translation (NAT) gateway hosted in a public subnet. The NAT gateway would then use the internet gateway to talk to ECR and ECS. Now that AWS PrivateLink support has been added, instances in both public and private subnets can use it to get private connectivity to download images from Amazon ECR. 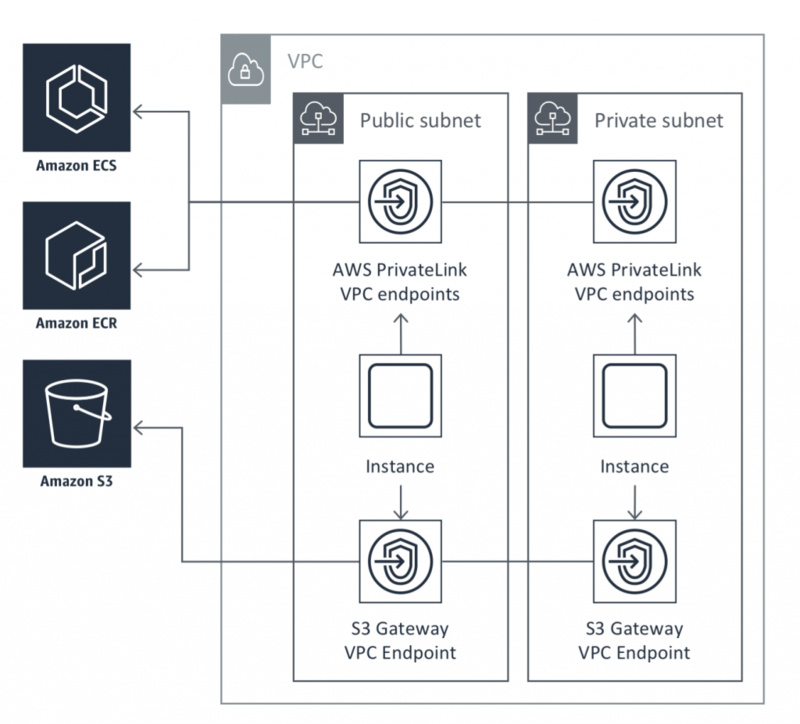 Instances can also communicate with the ECS control plane via AWS PrivateLink endpoints without needing an internet gateway or NAT gateway. Gateway VPC endpoint for Amazon S3. This allows instances to download the image layers from the underlying private Amazon S3 buckets that host them. AWS PrivateLink endpoints for ECS. These endpoints allow instances to communicate with the telemetry and agent services in the ECS control plane. This post explains how to create these resources. In the VPC console, create the interface VPC endpoints for ECR using the endpoint creation wizard. Choose AWS services and select an endpoint. Substitute your AWS Region of choice. Next, specify the VPC and subnets to which the AWS PrivateLink interface should be added. 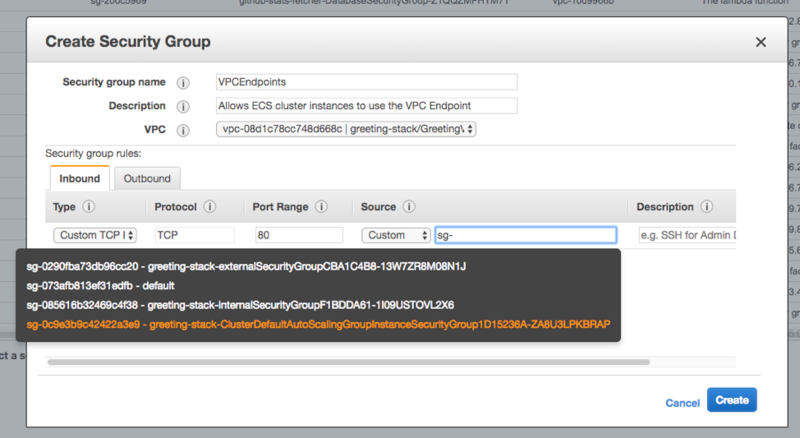 Make sure that you select the same VPC in which your ECS cluster is running. To be on the safe side, select every Availability Zone and subnet from the list. Each zone has a list of the subnets available. You can select all the subnets in each Availability Zone. However, depending on your networking needs, you might also choose to only enable the AWS PrivateLink endpoint in your private subnets from each Availability Zone. Let instances running in a public subnet continue to communicate with ECR via the public subnet’s internet gateway. Next, enable Private DNS Name, which is required for the endpoint. A private hosted zone enables you to access the resources in your VPC using the Amazon ECR default DNS domain names. You don’t need to use the private IPv4 address or the private DNS hostnames provided by Amazon VPC endpoints. The Amazon ECR DNS hostname that the AWS CLI and Amazon ECR SDKs use by default (https://api.ecr.region.amazonaws.com) resolves to your VPC endpoint. Lastly, specify a security group for the interface itself. This is going to control whether each host is able to talk to the interface. The security group should allow inbound connections on port 80 from the instances in your cluster. You may have a security group that is applied to all the EC2 instances in the cluster, perhaps using an Auto Scaling group. You can create a rule that allows the VPC endpoint to be accessed by any instance in that security group. Finally, choose Create endpoint. The new endpoint appears in the list. The next step is to create a gateway VPC endpoint for S3. This is necessary because ECR uses S3 to store Docker image layers. When your instances download Docker images from ECR, they must access ECR to get the image manifest and S3 to download the actual image layers. S3 uses a slightly different endpoint type called a gateway. Be careful about adding an S3 gateway to your VPC if your application is actively using S3. With gateway endpoints, your application’s existing connections to S3 may be briefly interrupted while the gateway is being added. You may have a busy cluster with many active ECS deployments, causing image layer downloads from S3. Or, your application itself may make heavy usage of S3. In that case, it’s best to create a fresh new VPC with an S3 gateway, then migrate your ECS cluster and its containers into that VPC. To add the S3 gateway endpoint, select com.amazonaws.region.s3 on the list of AWS services and select the VPC hosting your ECS cluster. Gateway endpoints are added to the VPC route table for the subnets. Select each route table associated with the subnet in which the S3 gateway should be. Instead of using a security group, the gateway endpoint uses an IAM policy document to limit access to the service. This policy is similar to an IAM policy but does not replace the default level of access that your applications have through their IAM role. It just further limits what portions of the service are available via the gateway. It’s okay to just use the default Full Access policy. Any restrictions you have put on your task IAM roles or other IAM user policies still apply on top of this policy. For information about a minimal access policy, see the Minimum Amazon S3 Bucket Permissions for Amazon ECR. Choose Create to add this gateway endpoint to your VPC. When you view the route tables in your VPC subnets, you see an S3 gateway that is used whenever ECR Docker image layers are being downloaded from S3. In addition to downloading Docker images from ECR, your EC2 instances must also communicate with the ECS control plane to receive orchestration instructions. Create these three interface endpoints in the same way that you created the endpoint for ECR, by adding each endpoint and setting the subnets and security group for the endpoint. After the endpoints are created and added to your VPC, there is one additional step. Make sure that your ECS agent is upgraded to version 1.25.1 or higher. For more information, see the instructions for upgrading the ECS agent. If you are already running the right version of the ECS agent, restart any ECS agents that are currently running in the VPC. The ECS agent uses a persistent web socket connection to the ECS backend and VPC endpoints do not interrupt existing connections. The agent continues to use its existing connection instead of establishing a new connection through the new endpoint, unless you restart it. This restarts the ECS agent without stopping any of the other application containers on the host. Your application may be stateless and safe to stop at any time, or you may not have or want SSH access to the underlying hosts. In that case, choose to just reboot each EC2 instance in the cluster one at a time. This restarts the agent on that host while also restarting any service launched tasks on that host on a different host. 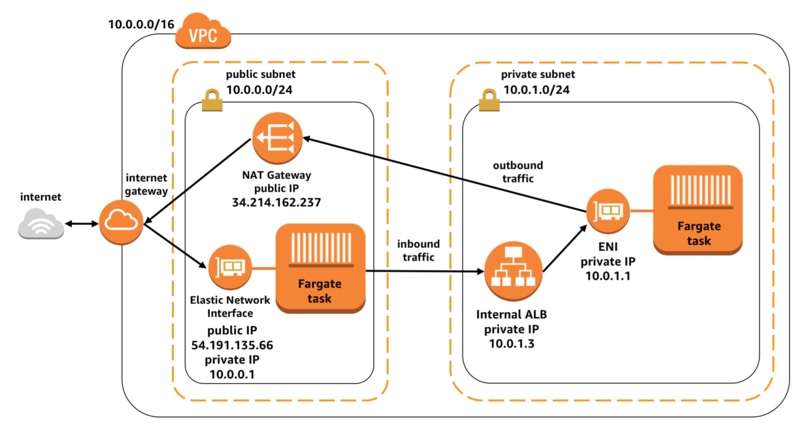 In this post, I showed you how to add AWS PrivateLink endpoints to your VPC for ECS and ECR, including an S3 gateway for ECR layer downloads. The instances in your ECS cluster can communicate directly with the ECS control plane. They should be able to download Docker images directly without needing to make any connections outside of your VPC using an internet gateway or NAT gateway. All container orchestration traffic stays inside the VPC. AWS Fargate is a compute engine that uses containers as its fundamental compute primitive. 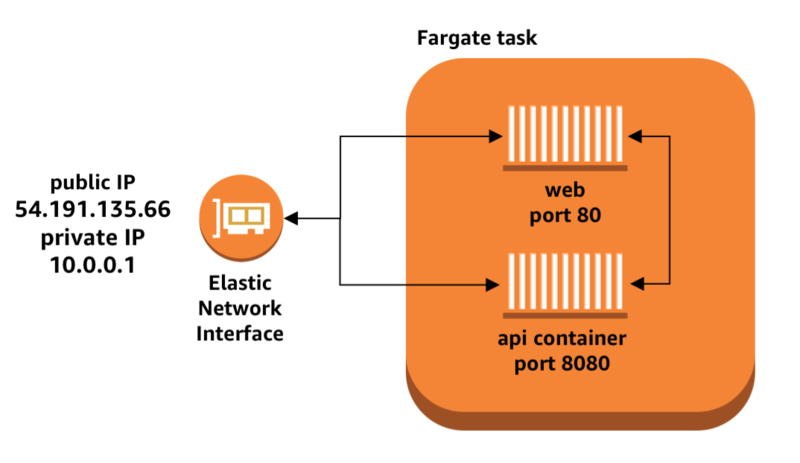 AWS Fargate runs your application containers for you on demand. You no longer need to provision a pool of instances or manage a Docker daemon or orchestration agent. Because the infrastructure that runs your containers is invisible, you don’t have to worry about whether you have provisioned enough instances to run your containerized workload. You also don’t have to worry about whether you’re using those instances efficiently to avoid paying for resources that you don’t use. You no longer need to do undifferentiated heavy lifting to maintain the infrastructure that runs your containers. AWS Fargate automatically updates and patches underlying resources to keep you safe from vulnerabilities in the underlying operating system and software. AWS Fargate uses an on-demand pricing model that charges per vCPU and per GB of memory reserved per second, with a 1-minute minimum. At re:Invent 2018 we announced Firecracker, an open source virtualization technology that is purpose-built for creating and managing secure, multi-tenant containers and functions-based services. Firecracker enables you to deploy workloads in lightweight virtual machines called microVMs. These microVMs can initiate code faster, with less overhead. Innovations such as these allow us to improve the efficiency of Fargate and help us pass on cost savings to customers. Effective January 7th, 2019 Fargate pricing per vCPU per second is being reduced by 20%, and pricing per GB of memory per second is being reduced by 65%. Depending on the ratio of CPU to memory that you’re allocating for your containers, you could see an overall price reduction of anywhere from 35% to 50%. The following table shows the price reduction for each built-in launch configuration. Many engineering organizations such as Turner Broadcasting System, Veritone, and Catalytic have already been using AWS Fargate to achieve significant infrastructure cost savings for batch jobs, cron jobs, and other on-and-off workloads. Running a cluster of instances at all times to run your containers constantly incurs cost, but AWS Fargate stops charging when your containers stop. With these new price reductions, AWS Fargate also enables significant savings for containerized web servers, API services, and background queue consumers run by organizations like KPMG, CBS, and Product Hunt. If your application is currently running on large EC2 instances that peak at 10-20% CPU utilization, consider migrating to containers in AWS Fargate. Containers give you more granularity to provision the exact amount of CPU and memory that your application needs. You no longer pay for instance resources that your application doesn’t use. 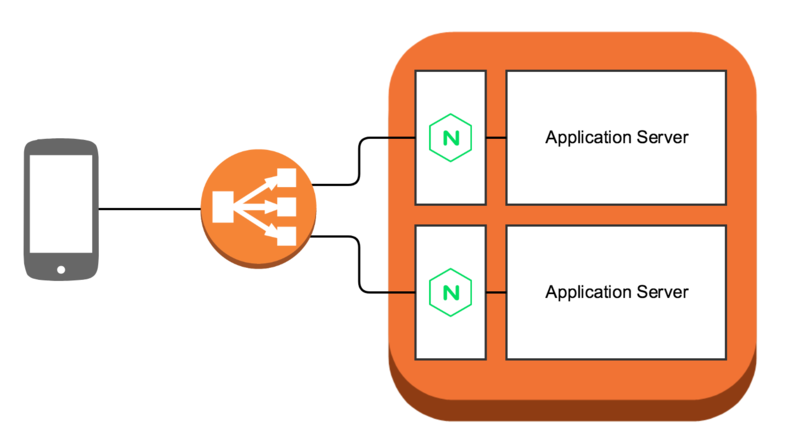 If a sudden spike of traffic causes your application to require more resources you still have the ability to rapidly scale your application out by adding more containers, or scale your application up by launching larger containers. 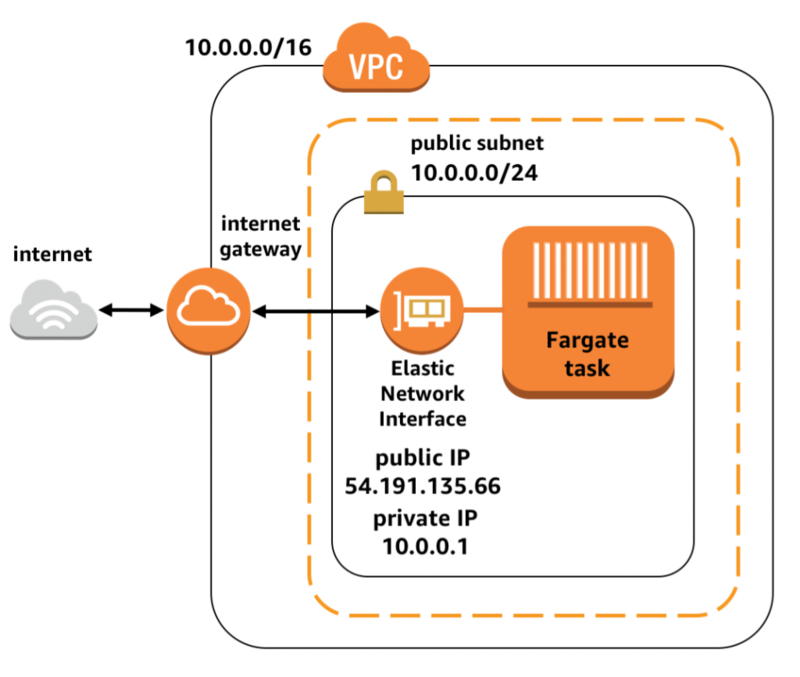 AWS Fargate lets you focus on building your containerized application without worrying about the infrastructure. This encompasses not just the infrastructure capacity provisioning, monitoring, and maintenance but also the infrastructure price. Implementing Firecracker in AWS Fargate is just part of our journey to keep making AWS Fargate faster, more powerful, and more efficient. Running your containers in AWS Fargate allows you to benefit from these improvements without any manual intervention required on your part. AWS Fargate has achieved SOC, PCI, HIPAA BAA, ISO, MTCS, C5, and ENS High compliance certification, and has a 99.99% SLA. You can get started with AWS Fargate in 13 AWS Regions around the world. The AWS Cloud Development Kit (AWS CDK) is an open-source software development framework to define cloud infrastructure in code and provision it through AWS CloudFormation. The AWS CDK integrates fully with AWS services and offers a higher-level object-oriented abstraction to define AWS resources imperatively. 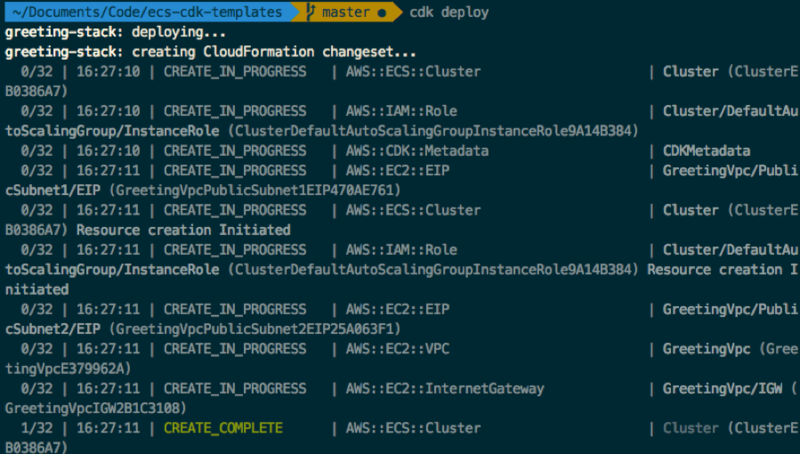 The AWS CDK now includes constructs for ECS resources, allowing you to deploy a fully functioning containerized application environment on AWS with just a few lines of simple, readable code. Here’s how it works. There are two load balancers, one of them allows anyone on the internet to talk to your greeter service. The other is internal and designed to allow the greeter service to talk to the other greeting and name services. In total, you need to add five more high-level constructs to your AWS CDK application: two load balancers and three services. For this configuration, the code defines a single load balancer with a single listener on port 80, but adds two different services behind it. If the path of the request looks like /name, it sends the request to your name service. If it looks like /greeting, it sends the request to the greeting service. If you’d like to try deploying this microservice stack yourself or using it as the basis for building your own AWS CDK stack, you can find the full AWS CDK example code on GitHub. Be sure to check out the AWS CDK documentation and the official AWS CDK construct for Amazon ECS on NPM. Starting today you can opt in to a new Amazon Resource Name (ARN) and resource ID format for Amazon ECS tasks, container instances, and services. The new format enables the enhanced ability to tag resources in your cluster, as well as tracking the cost of services and tasks running in your cluster. In most cases, you don’t need to change your system beyond opting in to the new format. However, if your deployment mechanism uses regular expressions to parse the old format ARNs or task IDs, this may be a breaking change. It may also be a breaking change if you were storing the old format ARNs and IDs in a fixed-width database field or data structure. After you have opted in, any new ECS services or tasks have the new ARN and ID format. Existing resources do not receive the new format. If you decide to opt out, any new resources that you later create then use the old format. You can read more about the exact details of the change, including a format comparison, in the FAQ. I recommend that you test the new format in isolation before opting in globally. Depending on whether your software interacts with instance, service, or task ARNs, you may want to be careful about how you opt in to avoid breaking your existing implementation. There are several ways to do this. The easiest way to opt in is to use separate AWS accounts for your testing and QA environment and your production environment. In this case, you could choose to opt in your entire test account by opting in for the AWS account root user. All IAM users and roles within the account are then opted-in. You can easily reverse the opt-in decision by opting out the root user. After you have verified that all your deployments work as expected, you can opt in for your main production account. If you use a single account to host all your resources and want to test the new ARNs in a gradual rollout, you need to be more careful about how you opt in. You may consider testing by opting in one AWS Region that you don’t normally use. Spin up your resources there to verify that they work before opting in your primary Region. Alternatively, you can decide to opt in for a specific test IAM user or role and conduct testing before opting in for the entire account. In this post, I explore how to opt in for a specific IAM user and role and to migrate your resources. There are a few prerequisites to opting into the new ARN and resource ID format. First, make sure that you can access the AWS account root user, so that you can opt in for all IAM users and roles on the account by default. Additionally, the root user can opt in for any single IAM user or role on the account, per Region. Individual IAM users and roles can still opt in or out separately. In particular, getting the new format on your cluster instances involves opting in for the instance role that the instance assumes when it boots up. This role allows the instance to communicate with the ECS control plane and register itself to receive an ARN. For the instance to get a new-format ARN, the role that the instance uses must be opted in. Depending on how your organization deploys clusters, you may need to opt in to the new format on other IAM users or roles that touch your ECS cluster. For example, you may have an IAM user that you use to access the console and create an ECS cluster. You also may use AWS CodeDeploy, which has an IAM role that allows it to make deployments and update that service with the latest version of your application’s Docker container. Both roles should be opted in. Otherwise, CodeDeploy causes your service to deploy tasks with the old format. For the best results, create a new IAM user that you can use for testing the new ARN format. That way, you can continue to interact with your existing ECS deployments on your original IAM user without accidentally switching your live services to the new ARN format. After your testing IAM user is created, access the opt-in page and turn on the new ARN format for this user. At this point, any services or tasks that you now create in any cluster with this IAM user will have the new ARN format. However, you also need to update the ARN format on the instances in the cluster. To get the new instance ARN format, create an instance role. This role is used for each instance in the ECS cluster. After you opt in for the role, any instance that registers itself with the ECS control plane using that role gets the new ARN format. Open the IAM console and choose Roles, Create role. Specify the type of role you are creating. 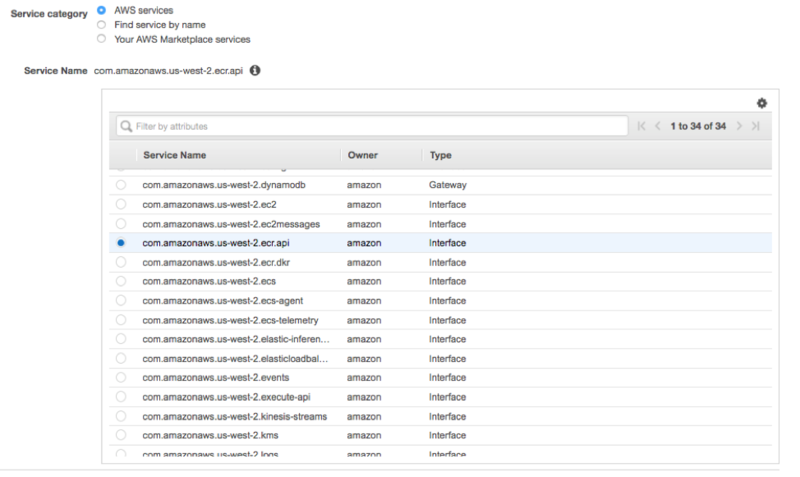 For this example, create an AWS service-linked role and choose EC2 as the service that will use the role. The next step is to add permissions for this role. In the search box, type AmazonEC2ContainerServiceforEC2Role. Select the check box to attach this policy to the role. This policy document is managed by AWS and has all the permissions required for an EC2 instance to act as a host in an ECS cluster. Finally, opt in for this role so that when an EC2 instance uses the role to register itself in the EC2 cluster, it receives the new ARN format. To do this, log in as the root user, and navigate to the opt-in page. This time, opt in for the instance role. Existing resources do not receive the new ARN format until they are re-created. To get the new ARNs, use the opted-in IAM user and opted-in instance role to create an opted-in cluster. 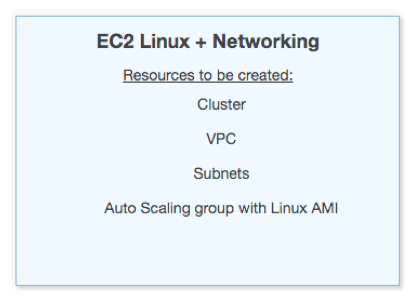 Open the cluster creation wizard, and create a new EC2 Linux + Networking cluster. After the cluster launches, navigate to the ECS Instances list and verify that the instances have the new ID format. The last part is to launch a service in the cluster. Be sure to use the IAM user that you opted in earlier. Task definitions are not changed by this opt in, so you can create a clone of an existing service using the same task definitions that you are already using. As a best practice, do a blue/green infrastructure rollout by creating a full parallel stack: a new cluster of EC2 instances, services, tasks, and any load balancers. 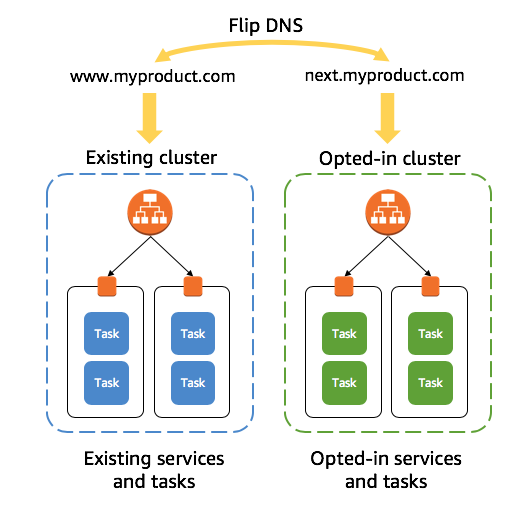 Then, direct traffic from your previous cluster to the new cluster by switching the DNS CNAME of your website to point at the new stack’s load balancer. This approach allows you to test the new stack without interrupting your existing stack. After you have verified that it works, you can switch traffic over to the new stack without any downtime. You have now tested opting in to the new ARN and resource ID format for ECS container instances, services, and tasks. If everything worked properly, you can opt in across your full account today by using the root user to opt in. Starting January 1, 2020, all newly created ECS resources receive the new ARN and resource ID format. I recommend testing the new ARNs now, even if you don’t intend to manually opt in your existing resources at this time.